As recently as five or six ago, Mayfair was once London’s least accessible area, exclusively reserved for those either “in the know”, or with a spinal stenosis surgeon on speed dial, to compensate for lifting heavy wallets or Dover Street Market shopping bags. Making the most of the rare brilliant sunshine, we choose to sit outside, on the restaurant’s secluded courtyard. A hidden oasis, the outdoor dining space at Hush is notably bedecked with lurid green plastic grass possibly sourced from the same warehouse as Mickey Rourke’s new face. Elsewhere, white parasols thwart sun burn, but flood the starched table linen and heavy wicker dining chairs with natural light. A sounder of guests’ choice to smoke cigarettes between mouthfuls is borderline infuriating, but the whole set up transports me to a cobbled, backstreet piazza in Rome, 1100 miles away from central London. As for the food, the menu at Hush is so eclectic it seems to take forever to decide on a simple order, requesting numerous recommendations. Classic dishes such as whole Dover Sole, sirloin Tagliata and a hamburger (with or without truffled brie) are joined by contemporary spins, including duck confit shepherd’s pie. In addition, a number of pasta dishes and small, tapas-style, sharing plates are also on offer. Perhaps inspired by the weather, we select a number of small bites in order to sample a vaster slice of the menu. First, a large humble Yorkshire pudding (£5) is joined by a silky smooth puree of caramelised garlic. A refreshing break from gravy, the garlic has profound depth of flavour, enough to clear a packed train carriage, after eating, with just one sharp breath. Hush’s classic steak tartare (£15), as opposed to a ‘chipotle’ version, stirs memories of the famous Mr Bean sketch, so far as it looks exactly the same as the raw beef burger that Rowan Atkinson’s character fruitlessly attempts to escape. The table holds no sugar pot or hollowed-out cob roll for us to hide it, so we dig in. Although less prettily presented than most, the steak tartare is rife with capers, tabasco and generous seasoning, compensating for the fact that the heavily chopped meat has a gummy texture. Artichokes Milanese (£12), on the other hand, are highly recommended over a scallop dish. An unsurprisingly prized ingredient – expensive and arduous to prepare – this dish presents nuggets of deep-fried artichoke heart, accompanied by an aioli spiked with lemon juice. An all-time favourite ingredient of mine, the octopus (£14) at Hush is cooked remarkably well, though the delicate cephalopod is completely overwhelmed by a bed of smoked cauliflower, ginger and yoghurt. With such harsh lactic acid, the yoghurt instead tastes of soured goat’s cheese. Far better is a simple pandemonium of prawns aggressively cooked over the plancha grill (£14). Perfectly cooked, the fragrant tiger prawns are served whole with the heads demanding for the luscious juice to be slurped, much to the disgust of nearby tables, complemented by a subtle chilli dressing and burnt lime which neutralises some of the chilli heat. A stone cold classic British dessert, bread and butter pudding seems to have fallen out of favour in recent years. Conversely, the past three I’ve encountered have been on Mayfair restaurant menus. Hush’s take on the classic (£7) is dressed up with whisky and brown butter, favouring brioche bread. Naturally, the overall composite is a stodge-laden heart attack on a plate, but a delicious one, at the absolute least. The restaurant’s now famous Mars bar cheesecake (£7), on the other hand, has tremendous depth and is peculiarly light, until slathered with the accompanying molten chocolate sauce. 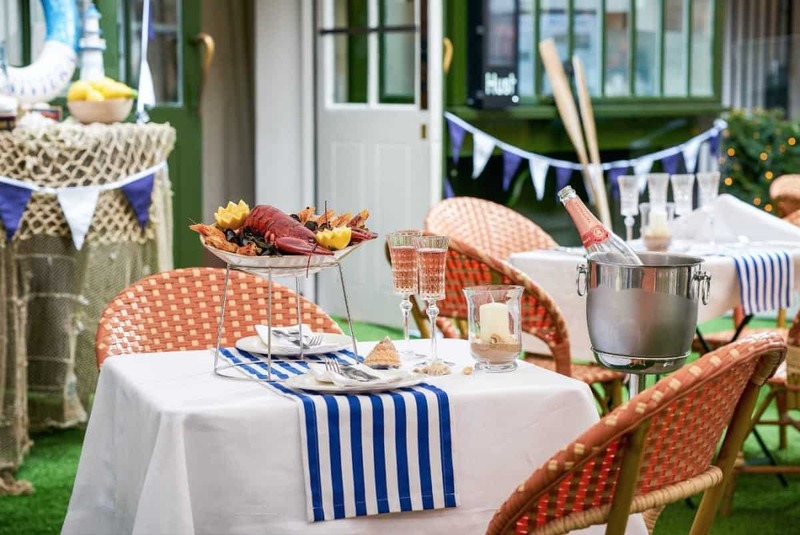 A classic, unspoilt, unstuffy Mayfair institution – the al fresco courtyard at Hush is one of the city’s most comfortable, so be sure to take advantage of the set up before the rain makes an unwelcome reappearance. Hush can be found at Lancashire Court, 8 Brook St, London, W1S 1EY.